Alcoa’s (NYSE: AA) stock price has gained significant momentum since Norsk Hydro, a Norwegian Aluminum producer, announced its plans to halt the production at its Alunorte alumina refinery in Brazil. Alunorte, the world’s largest alumina factory outside of China, had been operating at half capacity since March amid an environmental dispute between Brazilian authorities and Norsk Hydro, which had caused alumina prices to soar over the last few months. This coupled with the uncertainty of production due to Alcoa’s Australian workers strike resulted in a surge in alumina prices to $640 per ton in early September. Going forward, given the recent developments and above-mentioned factors, we expect the average price of aluminum and alumina for Alcoa to be $2,237/ton and $487/ton, respectively, in 2018. Our detailed estimates for Alcoa’s key drivers that impact its price estimate are available in our interactive dashboard – Alcoa’s Price Estimate . You can make changes to our assumptions to arrive at your own estimate for the company. Below, we will discuss the factors that are expected to drive Alcoa’s price and valuation in the near-term. Alunorte, the largest producer of alumina outside of China, had been operating at half capacity since March due to the company’s dispute with the Brazilian authorities. Consequently, major aluminum producers, including Alcoa, had projected a global alumina and aluminum deficit in 2018, which caused the prices of these commodities to rise sharply. To add to this, Norsk Hydro recently announced the production halt at the Alunorte refinery. This is likely to worsen the global supply of alumina and aluminum, propping up the prices of both the commodities in the coming months. Since Alcoa is a major producer of alumina and aluminum, it is bound to benefit from the rising commodity prices in the forthcoming quarters. 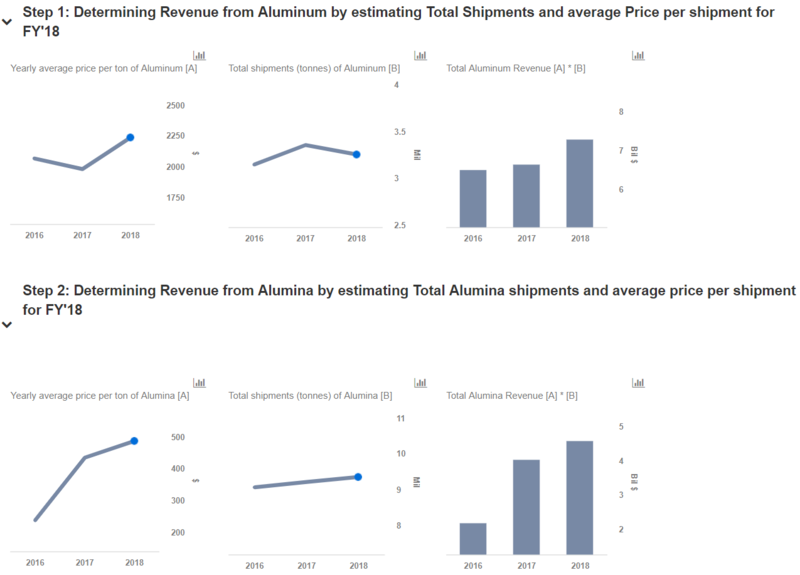 Accordingly, we expect Alcoa’s average price of aluminum and alumina to be $2,237/ton and $487/ton, respectively, translating into $12.88 billion in revenues for the company in 2018. Earlier this year, the US government announced sanctions against trade with United Company Rusal (UC Rusal), the world’s second-largest aluminum company by primary production output. UC Rusal accounted for about 12% of all primary demand in the US in 2017, which implies that the aluminum market will be severely hit by the US sanctions. Consequently, these sanctions have been eased through the year, with the US Treasury allowing companies to enter into new deals for UC Rusal metal 2019 onward, thus, hinting a full-removal of sanctions next year. While the resolution for this is awaited until the midterm elections in the early November, the Treasury has extended the deadline for investors to divest holdings of equity, debt, and other assets in the sanction-hit Russian manufacturers EN+group and Rusal until November 12. Further, there are chances that if the majority stakeholder, Oleg Deripaska, ceded control from UC Rusal, the sanctions might be removed faster. These developments have led to a rise and a subsequent decline in aluminum prices, making the market extremely volatile. The air of uncertainty around the Rusal sanctions is likely to continue to support aluminum prices and aluminum-related stocks until a final outcome is achieved later this year or early next year. Consequently, we believe that Alcoa will enjoy the higher average prices in the next couple of quarters, which will bolster its top-line as well as valuation.